While the ad hoc committee on the Electoral Logistics is chaired by an INEC National Commissioner, Air Vice Marshal Tijjani Mu'azu (retd. 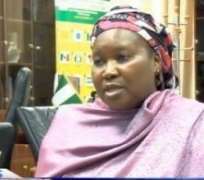 ), another INEC National Commissioner, Amina Zakari, has been named the chairman of the ad hoc committee on National Collation Centre. But the opposition political parties led by the Peoples Democratic Party have rejected the appointment of Zakari as the chairperson of the Committee on National Collation Centre, claiming that she is President Muhammadu Buhari's niece. But apart from Mu'azu, other members of the Adhoc Committee on Electoral Logistics are Abubakar Nahuche (National Commissioner) and Mallam Mohammed Haruna (National Commissioner). He also said it could fuel violence, adding that it would be injurious to Nigeria's democracy. “The PDP Presidential Campaign Organisation vehemently and unequivocally rejects, in its entirety, the appointment of Mrs Amina Zakari, President Buhari's blood relation, as the head of the collation of results, in the same election in which his uncle, President Buhari, as a candidate, has displayed a huge desperation to win. He said that in appointing Zakari to head the collation of the presidential election result, the INEC chairman had confirmed that he had been compromised and that he had succumbed to pressure by the Buhari Presidency and APC to open the way for Buhari's self-succession. Ologbondiyan called on all Nigerians and particularly the National Peace Committee to note that with the appointment of Zakari the INEC chairman was setting the stage for “a very huge political crisis,” which, he said, was capable of derailing Nigeria's democratic process. On its part, APGA described Zakari's appointment as a desperate attempt to rig the forthcoming elections. Mike Angel, the Director of Strategic Communication of the campaign organisation of the party's presidential candidate, John Gbor, said this in an interview with one of our correspondents. Angel said, “Aside from being nepotistic, it's highly unethical. It's a desperate attempt by the APC regime to rig the election wholesale. We can see the reason why President Buhari would not assent to the Electoral Act (Amendment) Bill. Fayose, in his twitter handle on Thursday wrote, “Instead of INEC appointing Amina Zakari, a blood relation (niece) of President Buhari, as the chairperson of INEC Advisory Committee and Presidential Election Collation Centre Committee, why not just appoint one of the President's children as INEC chairman?” Fayose wrote on Twitter. Also, the Presidential candidate of the Allied Congress Party of Nigeria, Mrs Oby Ezekwesili, said INEC had bowed to Buhari's wish. She asked, “Or how else can one describe this repugnant action of placing the President's niece, Mrs Amina Zakari, at the head of collation of election results? He stated, “Mrs Amina Zakari's appointment as chairman of the ad hoc Committee on Collation Centre should not be interpreted as a plan to rig the elections. Mrs Zakari played a similar role in the 2015 general elections and I have yet to hear anybody say that the elections were rigged. A Second Republic lawmaker, Junaid Mohammed, had in an interview with Saturday PUNCH on July 23, 2016, said Zakari was the daughter of Buhari's elder sister.